Begins Friday February 23rd with dinner at 6pm, followed by informal chat, discussion and prayer. 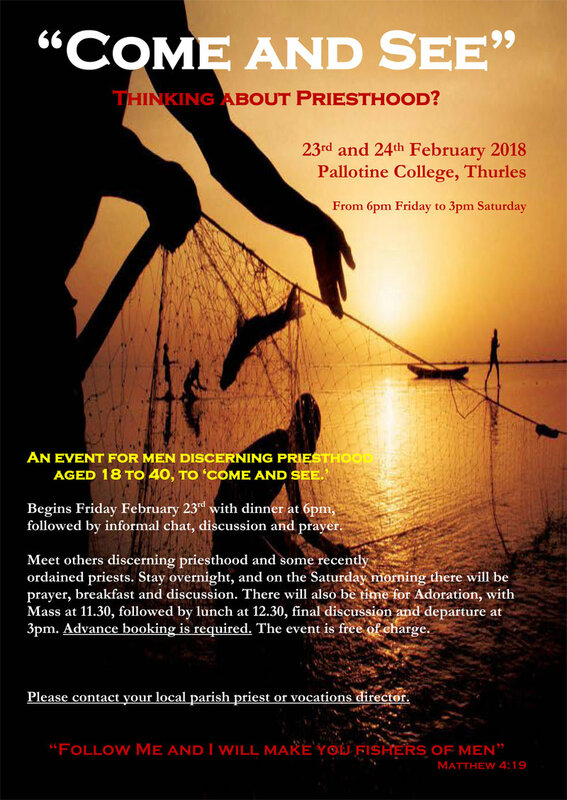 Meet others discerning priesthood and some recently ordained priests. Stay overnight, and on the Saturday morning there will be prayer, breakfast and discussion. There will also be time for Adoration, with Mass at 11.30am (Sat 24th), followed by lunch at 12.30pm, final discussion and departure at 3pm. Advance booking is required. The event is free of charge. Vocations Director: Rev. Brian Boyle (Tel: 025 32963). Assistant Vocations Director: Rev. Damien Lynch (Tel: 021 7332948).